No sooner had the Wales Audit Office received a complaint about the Scarlets/Marstons land deal in Llanelli than Rebecca Television has published further revelations about David Pickering, chairman of the WRU, and another interesting property deal involving many of same characters just up the road at Llangennech. Our story begins back in 2007 when the Ministry of Defence, which then owned what locals know as the RN, began discussions with Carmarthenshire County Council about the feasibility of turning the 37 acre site in Llangennech into a mixed development of housing, retail units, a hotel and what an MoD official quaintly termed "drinking establishments". The idea was to get the site adopted for redevelopment under the council's Local Development Plan, and documents obtained under FOI show that discussions had reached a fairly advanced stage by 2008, with meeting notes revealing that the Ministry and the council had been talking about how to overcome objections from public bodies such as the Countryside Council for Wales, Welsh Water and the Environment Agency. At one point an MoD bod happily notes that the Environment Agency appeared to be taking a rather more pragmatic approach to the concept. For reasons which are not clear, the meetings came to an abrupt end and the MoD decided to sell the site. According to reports from the time, this was to have taken place by public auction, but at the last minute up popped Carmarthenshire County Council which was very keen to secure ownership of the site - not for itself, but for "persons known to some of the officers" who had a potential employment opportunity which could bring many new jobs to Llangennech. Things then moved rather swiftly, with the chief executive of Carmarthenshire County Council going before the full council to persuade them to approve a deal whereby the council would purchase the site from the MoD and then immediately resell it to the investors - unknown except to Mr James and possibly a couple of other senior officers, with the investors reimbursing the council for any expenses incurred. 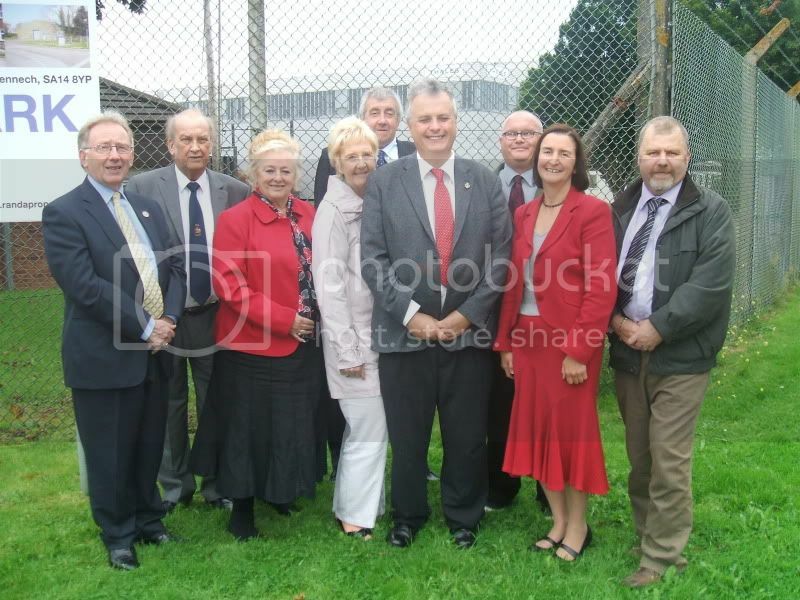 Several councillors who were present at the meeting in February 2009 recall feeling somewhat queasy with what they were being asked to sign off, and the minutes of the meeting show that questions were asked as to why the mystery investors could not deal with the MoD direct. There has never been a satisfactory answer to the question why the MoD, which had been preparing to sell the site by auction, could not or did not want to deal with the private investors. Also unexplained is why the deal went to the full council for approval, when the size of the transaction was well within the scope of powers delegated by full council to the Executive Board and officers. Even more unusually there is no record of the deal ever having been discussed by the Executive Board, which at the time was headed by Cllr Meryl Gravell. What appears to have swayed the more nervous councillors present was the prospect held out by senior officers of new jobs being created in the area after staff previously employed by the MoD had been made redundant. And so the deal was approved, and the council purchased the site before immediately reselling it to the investors "known to some of the officers". At the last minute a clause was inserted into the sale agreement to keep local councillors happy. This gave Llangennech AFC the right to buy a portion of the MoD site for £1 at any date up to May 2014, as the club desperately needed a larger ground. That some councillors at the time did feel uneasy about the way the deal was done was borne out a few months later when the Western Mail disclosed that the two men behind the venture were David Pickering, then as now chairman of the Wales Rugby Union, and a business partner, Robert Lovering. According to Rebecca Television, Land Registry records show that the site is owned by Robert Lovering alone, and that he paid £845,000 for the 37 acre estate which was sold in two lots (not £700,000 as reported by the Western Mail). The same nervous councillors told the Western Mail that they wondered why other potential bidders had been prevented from competing to buy the RN, and according to Rebecca another developer had been proposing to offer over £2 million for this piece of real estate. Securing best value for the taxpayer does not appear to have been top of the priority list, but Carmarthenshire County Council is adamant that the deal was subject to an independent valuation. In view of what we now know about the council and independent valuations (see Caebrwyn), this assurance will probably not put inquiring minds at rest. The council nevertheless rejected a freedom of information request asking for disclosure of the valuation report. For those unfamiliar with the area, the Llangennech site (now renamed Stradey Business Park, although it is nowhere near Stradey Park) is impressive, and huge. It contains a large number of well-maintained buildings, including office accommodation and some very large warehouses. The MoD certainly did not leave a wreck behind when it went. Bearing in mind that Marstons paid £850,000 for a 120 year leasehold on an undeveloped site of 1.17 acres nearby in 2012, the value of a 37 acre site with lots of well-maintained buildings just up the road must be rather more. Messrs Pickering and Lovering ("known to some of the officers"), or possibly just Mr Lovering, had bagged themselves an amazing bargain which must be worth several millions today. Defending the deal to the Western Mail back in May 2009 (a separate article here) assistant chief executive Chris Burns said "Local authorities are often criticised for being slow to react. In this case we have been entrepreneurial". Unfortunately for the council taxpayer, being entrepreneurial meant helping someone else make pots of money. This brings us to one of the most extraordinary aspects of the deal. As Rebecca Television reports, David Pickering had and has a less than glorious track record in business, with a whole string of companies in which he was involved as a director and/or shareholder going bust in the years prior to the Llangennech deal. One of the biggest losers in these corporate collapses was HMRC which Rebecca Television estimates lost around £4 million in unpaid National Insurance, VAT and other taxes. 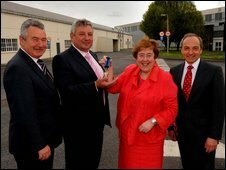 David Pickering was nevertheless the public face of the rebranded Stradey Business Park in Llangennech. Although it is not clear what his stake in the venture was, he remains the public face of R&A Properties, the private partnership which operates the site. It is also reasonable to suppose that he was one of the investors "known to some of the officers" that the councillors were told about. What is clear is that councillors were not told that they were being asked to sign off the sale of a publicly owned asset to a partnership which included someone with a very chequered financial record, a history of bad debts to HMRC and County Court judgements against him. Whether the MoD was made aware of the identity of the mystery investors is not known, but both councillors and the MoD might have had second thoughts if they had been told. Companies House records show that some of the companies associated with Pickering and Lovering have continued to lead a rather volatile existence since the Llangennech deal. One of them, Aggrelek Ltd, was dissolved in March this year. It was registered to an address on the Llangennech site, and both men were directors. Unusually, it went through five changes of name since 2010, with three name changes taking place in 2011. In the first Western Mail article from May 2009 David Pickering told Martin Shipton that the blue chip client he had up his sleeve was "sure" to provide 100 jobs before Christmas. Back at the council meeting in February councillors were told that there could be 25 jobs by September, 65 jobs within a year and up to 400 in the long term. Whether five years counts as "in the long term" is not clear, but the council says that 170 people are currently employed on the site. These include a cafe, a "man with a van", a gardening services business, an office run by the Prince's Trust (yes, Old Big Ears), a major road haulage firm, a small manufacturing company and Thales, the French defence giant. More jobs are about to be created by the imminent arrival of a night club where you will soon be able to bop the night away despite objections from some of the other tenants to the recent licensing application. The site's operators supported the licensing application by saying that a night club would provide entertainment for some of the many prominent visitors they get (more on that below). Back in 2009 David Pickering said that if he and Robert Lovering had not secured the deal, there was a danger that their blue chip client would have moved to France. Thales (the mystery blue chip client) is of course a French company. Why Thales, a massive defence group, decided it would rather be a tenant to two small-scale Welsh businessmen than buy the site itself is another mystery, but sure enough, they moved in and started work on Warthog armoured vehicles for the MoD. A glance at the site on Google maps shows that the part of the Llangennech estate where Thales operates was never going to employ large numbers of people for the simple reason that car parking is limited to about 18 vehicles. Unless they are employing Oompah Loompahs. Staying with our Western Mail article from May 2009, David Pickering explained that the venture would be operated by R&A Properties. Despite the name, this is not a limited company but a private partnership. "We've been advised to do it this way by our professional advisers", he told Martin Shipton. It is certainly unusual for a fairly large business undertaking not to operate as a limited company because it leaves the owners with unlimited liability in the event that things go wrong. On the other hand, partnerships do not have to disclose details of who is involved, shareholdings or accounts. Shortly after the Llangennech site was acquired, David Pickering told the Western Mail that the partnership had invested £200,000 in renovating some of the buildings. Where that money came from is not known, but more renovation work was carried out later. In December 2011 the county council awarded a grant of £281,000 to R&A Properties to refurbish two buildings, and newspaper and other reports show that senior council figures continued to retain a close interest in the venture. Around the same time Mark James, Meryl Gravell and David Pickering were spotted having lunch at nearby Machynys Golf Club. David Pickering was having lunch in Machynys Golf club two weeks ago- sitting at the next table to us with Carmarthenshire Chief Excutive, Mark James and Meryl Gravell. He was with another man with white hair and who had a hearing aid. After their lunch ended and the Carmathenshire people left, he and the other guy ordered a bottle of white wine and looked like they were celebrating something. ( With lunch they had drunk sparkling water). It is fair to say that Mark James and Meryl Gravell were not the only visitors. Despite his jet set lifestyle, David Pickering remains a loyal supporter of the Labour Party. In 2010 he got into a trouble for using a WRU e-mail address on invitations to a £1,000 a plate fund raising dinner for Labour in Cardiff. Rebecca Television's latest report says that yet another Pickering company, Stradey Safety Products, appears to have stopped trading. It is registered to an address on the Llangennech site. But there is good news as well. Hydro Industries, a company in which Pickering's partner Robert Lovering is involved, also operates from premises on the trading estate. It supplies water treatment technology, and was recently involved in a greening project down the road at Parc y Scarlets along with CWM Environmental (wholly owned by Carmarthenshire County Council), and Dragon Energy Solutions (previous post here). Sadly, things have worked out less well for Llangennech AFC, which was given an option to buy part of the site for £1 back in 2009 as a sweetener and a gesture of commitment to the local community. When the club tried to exercise its option, it ran into opposition from Mr Pickering (here). Discussions dragged on, with attention turning to an alternative site and the possibility that Messrs Pickering and Lovering might help fund a new site in return for cancelling the option. Subsequently, in 2013, the club was persuaded that the plot at the Llangennech business park was too small, and the club was looking at the possibility of using the sports field at Llangennech Junior School instead. It is understood that efforts to find the club a new home continue. Rebecca Television is continuing its investigation into the story, and this blog will monitor any new developments. All of the information in this piece has been gathered from newspaper reports, freedom of information requests and other sources in the public domain. It is important to stress that there is no suggestion that any of those involved have acted illegally. Nevertheless, serious questions remain to be answered, and the conduct of senior figures in the County Council once again raises concerns about governance and ethics. It is highly unlikely that the 2009 deal would have gone ahead had it not been for personal relationships, and it is hard to imagine that the council would have given such a big helping hand to anyone not "known to some of the officers". The story also illustrates the extent of personal ties between key players in the council and rugby bosses and the way in which their activities are now very far removed from the world of the players and ordinary supporters. Put simply, this is unhealthy and bad for both the council and the game. Anyone with further information is welcome to get in touch through the e-mail address at the top of this blog. Similarly, the author of this blog will be pleased to correct any errors contained in this piece and to provide any of those mentioned with a right of reply, provided the response is not defamatory. Wow, wow and wow again - if this is not the last nail in CCC's coffin then there is something REALLY corrupt going on in Wales. Alas, I know that when we uncovered something similar in my UK area and reported it to the police they kept us dangling and then quietly dropped the investigation citing "shortage of officers". We noted that senior police officers and council officials and councillors were members of the same ..... let's not go there as the matter might still come to court if times change. An appalling saga of arrogance, greed and cronyism. Thank you for cataloguing yet another depressing sequence of deals and events that again involves all the same old names. As Huw Llewellyn Davies would say, Wel wel wel wel wel wel. My understanding is that a Council can’t sell land “for a consideration less than the best that can reasonably be obtained” unless Cardiff Bay has formally given consent otherwise. How they go about getting the “best that can reasonably obtained” is not set out in statute. So they get a valuation. Q. What is land worth? A. What someone is prepared to pay for it. Q. What will someone pay for it? A. Look at similar recent examples and see what they sold for, or offer it for sale, and see what offers come in. Q. Are there any similar examples to the Llangennech site? A. Not that similar or recent. Q. Why not offer it for sale and see what it attracts? Q. Can we find out about the valuation? Q. Has the Council acted lawfully? A. Who knows? It’ll need more than a rebuffed FOI request to penetrate the wall of secrecy. Dealings done behind closed doors, with no transparency, involving huge sums of money and individuals with a less than impressive business history, will ensure that those inclined to detect the odour of rodents will certainly have their noses twitching. Coming after the Scarlets CarParkgate revelations, Members and the public might wish to see a bit more light shed on this as well. Surely the proper way to do this is "test market" the site and ask for "expressions of interest" - this is what most organisations do with such assets. Whether that should have been done by MOD or CCC is a moot point. And perhaps it is time for the District Valuer to come under the spotlight. Bloody hell! "Personal ties between council officers and rugby bosses" seems like an understatement - it's a veritable karma sutra! Except it's the council taxpayers who've been thoroughly and repeatedly and inventively f***ed. The scandals that you and Jacqui are exposing are beginning to read like a horror serial - and I'm becoming addicted. When can we expect the next 'fix' and what else can be dragged, kicking and screaming, into the daylight? All this disgusting misuse of public funds should be headlines in the media - everyone should know about it, not just those of us who read your blogs. Spread the word people! Talking of Coffins will the Goverment keep better jobs away from Wales to have carers for the Baby Boomers or will it look at the brain drain and say people should not have moved away in the first place. All these are detimantle to the Welsh Language and indeed poverty in Wales. Anon 12.08 What on earth are you trying to say? Probably a question framed by a CCC Executive member! Well done Cneifiwr! Keep digging as there is a lot more where that came from. I live in Llangennech and it's common knowledge that the whole thing was a stitch-up. Now we have to wait with baited breath to see what horrific developments will be granted permission on the site and watch our quiet little village destroyed. We already have articulated lorries driving through the village (come and see the cracks on the houses) as they make their way to Stradey Business Park. Oh yes, and the jobs they created (no local people) means we have to have these young guns speeding through the village in their suped-up first fiestas and throwing litter out the window. Here is an update regarding this mess. The school playing field has now been levelled. it turns out though the work was started without planning permission being sought. Residents have not had the chance to object to this development. Fair enough sort out the field for the school children but to expect residents to put up with the noise of football matches all weekend and training sessions in the evenings is so wrong. The school boundary is so near peoples gardens this cant be right? Waiting for the planning application to be posted in the locality of the school. I can see this being granted. So so wrong if that happens.